Should You Buy Amazon On The Dip? Amazon (AMZN) has corrected about 25% from its all-time high of $2,050.50 in September. Following the release of the earnings report on Friday Oct. 26, 2018, the stock fell as much as 9% during intraday trading, and closed 7.82% lower for the day. The company’s 3rd quarter earnings per share came in at $5.75, beating estimates of $5.62. However, Amazon (AMZN) reported sales revenue of $56.6 billion, missing the estimate of $57.08 billion. Nevertheless, revenue still showed YoY growth of 29.33%. The company also forecasted lower than expected revenue for Q4, between $66.5 billion and $72.5 billion. Even though Amazon (AMZN) beat earnings, market was more focused on the company missing revenue estimates. Top-line growth is usually seen as more important than bottom-line growth, because top-line growth is harder to manipulate than bottom-line earnings. I believe the market has overreacted last week. The real reason we saw shares of Amazon (AMZN) sell-off heavily on Friday was due to short-term traders unwinding their long positions as fast as possible following the earnings release. The stock had climbed 7% on Thursday Oct. 25, 2018 as traders had built up bullish positions while anticipating a strong earnings report, and what we saw was a ‘buy the dip, sell the news’ play out over those two trading sessions. I believe long-term investors have good reasons to stay bullish on the stock. Since the market has reacted so negatively to the company’s sales miss and guidance, let us take a dig deeper into its main sources of revenue using its latest 10-Q filings for Q3. ‘Online Stores’ sales grew by 10.11% YoY. 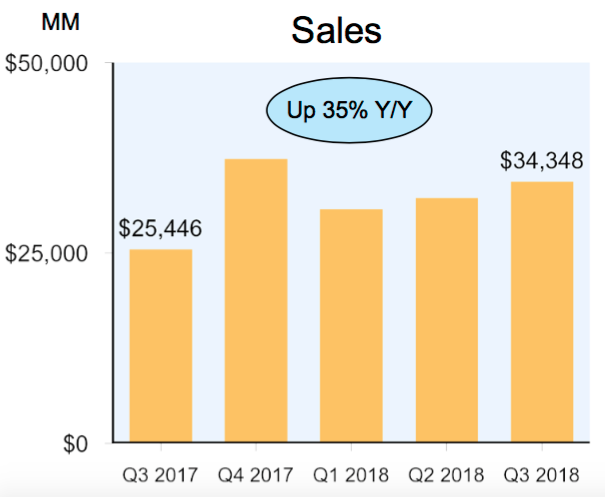 Breaking it down even further, Sales for North America grew by 35% YoY, while international sales grew by 13% YoY, as shown by the charts below from the 10-Q filings. While North American growth is solid, international growth rate is comparatively quite mediocre. Over the past several years, Amazon (AMZN) has invested heavily to develop its presence in several countries. However, the main two international markets where e-commerce growth is high are India and China. Amazon (AMZN) is clearly struggling to repeat its US growth story in these countries. The chart below shows operating profits for its international segment over the past year. While it is not profitable presently, it is encouraging to see that the losses have narrowed. The e-commerce market is growing in India at an annual growth rate of 51%, and in China at 34.3%. However, the two markets are where Amazon (AMZN) faces the most local competition as well. In China, Alibaba (BABA) leads the Chinese e-commerce market with a 58.2% market share, dwarfing Amazon (AMZN) China’s market share at 0.7%, as shown in the chart below. Amazon (AMZN)’s current place in China’s e-commerce market and the number and size of competitors it is up against certainly make it an uphill battle for the company. However, Amazon (AMZN) China is nowhere as weak as this chart may show. While Alibaba (BABA) is the biggest e-commerce player in China, and often directly compared to Amazon (AMZN), its business model is remarkably different from that of Amazon (AMZN). 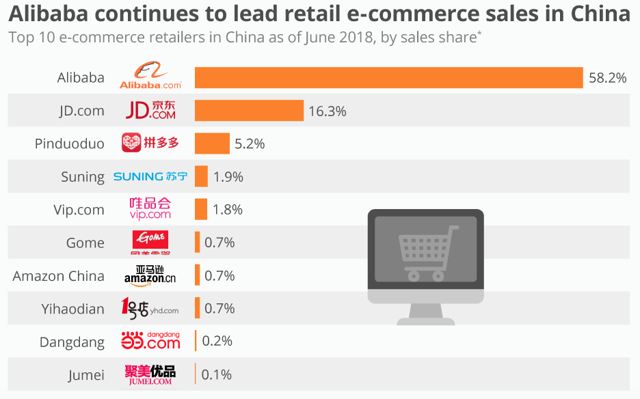 Alibaba (BABA) generates majority of its revenue from third-party sellers that use its online marketplace to connect with customers. Unlike Amazon (AMZN), Alibaba (BABA) does not own majority of the merchandise sold on its platform. Amazon (AMZN)’s business model involves high-quality logistics and fulfillment networks with bases in the US, UK and Japan. Alibaba (BABA) is making efforts to shift its business model towards that of Amazon (AMZN) by building it its own logistics and fulfillment networks. However, this will need huge investments and cash flow. While Alibaba (BABA) certainly has the potential and resources for this using its growing stream of cash flows, Amazon (AMZN)’s cash flow stream is just as strong. Amazon (AMZN)’s great leverage over Alibaba (BABA) is that it already has developed such networks and marketplaces in US, UK and Japan. Amazon (AMZN)’s strategy for growing into the Chinese market started with offering Chinese consumers Prime membership since 2016, and gives Chinese consumers the ability to order from its overseas marketplaces with free, cross-border shipping. Demand for international goods among Chinese consumers is strong, and Amazon (AMZN) is well positioned to fulfill these demands, putting it in a strong position to compete with Alibaba (BABA). While Amazon (AMZN) still holds a relatively minor market share regardless of these efforts, one of Alibaba (BABA)’s greatest weaknesses is one of Amazon (AMZN)’s greatest strength thanks to its business model, and that is counterfeit goods. Alibaba (BABA)’s current core business is acting as an intermediary between third-party sellers and customers. While this business model is very profitable, it also allows for many fraudulent retailers to use Alibaba (BABA)’s marketplace to sell counterfeit goods, and this has greatly damaged the company’s image over the past years. Undoubtedly, Amazon (AMZN) has also been dealing with counterfeit goods, but given that third-party transactions are a much smaller part of Amazon (AMZN)’s revenue base compared to Alibaba (BABA), Amazon (AMZN)’s brand image triumphs over that of Alibaba (BABA). Therefore, deteriorating trust in Alibaba (BABA)’s marketplace among Chinese consumers will play into Amazon (AMZN)’s favor, as consumers turn to Amazon (AMZN) to buy goods from international brands and take advantage of the free shipping incentives. In India, Amazon (AMZN) is in a stronger position, controlling about 31% of the market share as of March 2018. Realizing that Amazon (AMZN) had fallen behind in acquiring market share in China, CEO Jeff Bezos has strongly committed to invest $5 billion in India to build out its infrastructure. As a result, Amazon (AMZN) has become a heavyweight player in the market, with 42 fulfillment centers across the country, to be able to effectively deliver and fulfill the growing needs of Indian online shoppers. While these heavy investments have dragged down profitability for Amazon (AMZN)’s international segment, I believe Bezos has wisely targeted the fastest growing e-commerce market in the world. India has a population of 1.3 billion, out of which only 480 million are using the Internet. As a result, the nation has a high Internet usage penetration growth rate of 25% annually. Considering Amazon (AMZN)’s large-scale infrastructure establishment already present in the country, it is well positioned to capitalize on this high growth market and generate future streams of revenue. Flipkart is presently the leader in the Indian e-commerce market. One huge leverage that Amazon (AMZN) has over Flipkart, is that Amazon (AMZN) is a profitable corporation, with deep pockets and a healthy cash flow. On the other hand, Flipkart is unprofitable and burning through cash to spend aggressively on advertising and offering discounts to consumers to support and grow revenues. 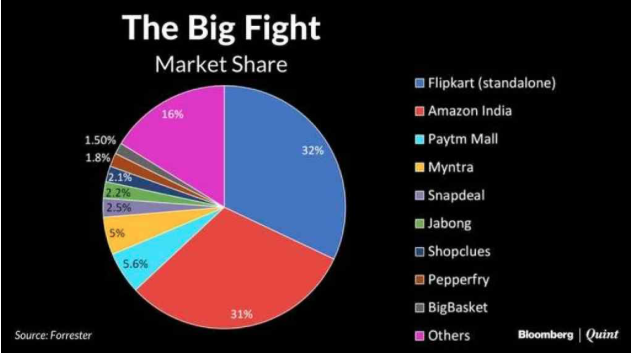 Amazon (AMZN) is in a much stronger financial position to engage in price wars and large-scale marketing to grow its market share over that of Flipkart’s. Consequently, India offers many factors to support Amazon (AMZN)’s future revenue-generating potential. Amazon (AMZN) Subscription Services revenue mainly refers to its Prime membership fees. This revenue segment showed strong YoY growth rate of 45.70% in Q3. While some analysts argue that growth in prime membership is decelerating, it is undoubtedly still a high-growth revenue source for the company. Nevertheless, the slowing growth rate has put off investors and is building up bearish sentiment for the stock. However, the Consumer Intelligence Research Partners have discovered an interesting trend in the spending habits of Prime members and non-Prime members. Prime members spend about $1400 on average per year buying merchandise on the website. On the other hand, non-members spend about $600 per year. They found that the gap in spending habits had actually widened from the year before as Prime members are spending more and more to take advantage of the subscription service. So while subscription growth is slowing, spending by existing subscribers is also growing, demonstrating that Amazon (AMZN) has been successfully encouraging Prime members to spend more time and money on the website. Consequently, as subscribers spend more and more, this continues to add to the ‘Online Stores’ revenue stream (which is on top of the subscription services revenue stream). It is also worth noting that there is no competitor in the market that is able to match up to what Amazon (AMZN) has to offer to its Prime subscribers. Prime membership not only offers subscribers two-day free delivery service on various products sold on Amazon (AMZN), but also includes access to a wide choice of e-books, audiobooks, digital videos and music. The lack of alternatives to Amazon (AMZN) Prime helps the company secure a relatively stable revenue stream, which allowed it to raise its Prime subscription fees this year from $99 to $119 annually. This in my view was a clever move to capitalize on Prime members’ loyalty to the service. 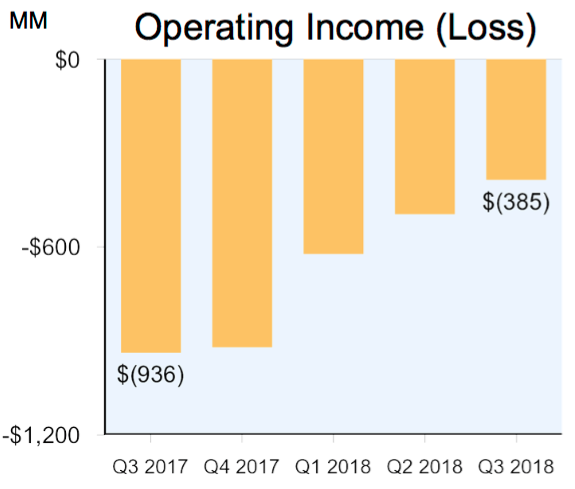 Now that Amazon (AMZN) is starting the reach a point where subscriber growth is slowing down, and existing customers are becoming increasingly devoted, I believe this was the right strategic move to increase its stream of top-line revenues from its subscription services segment. AWS is Amazon (AMZN)’s cloud computing unit, which grew 45.7% YoY. This segment is a growing cash cow for the company, as it accounted for 56% of Amazon (AMZN)’s total operating income in Q3. The cloud market is forecast to double in size to $302.5 billion by 2021, and AWS is presently a market leader with over 30% market share. While some investors are fretting about the fact that AWS is growing at a slower rate than its biggest competitors, such as Microsoft Azure growing at 76% in Q3, Amazon (AMZN) is still holding on strong to its market share. Addressing the increased competition in the market, Amazon (AMZN) cut prices for its Lightsail server by 50%. This had investors worried as this would hit Amazon (AMZN)’s AWS revenue stream, one of Amazon (AMZN)’s fastest growing units. However, strategically I believe this was a necessary and sensible move. Unlike its Prime subscription segment, the cloud sector is a highly competitive market. Hence to retain and continue to grow its market share, AWS needs to be more price competitive. While price cuts lower revenue, I believe this will be compensated for by growth in the overall cloud market. As long as AWS is able to maintain (or even further grow) its market share as the cloud market grows, revenues will continue to increase. The ‘Other’ revenue segment in Amazon (AMZN)’s 10-Q filings is mainly composed of advertising income. This segment has experienced immense growth, increasing 122% YoY to almost $2.5 billion. Amazon (AMZN) owns a treasure of data and analytics related to consumer shopping habits, allowing for more effective ad placements in front of the right users to increase the click rate. As a result, the company’s advertising revenue is growing strongly as a threat to Google (GOOG) and Facebook (FB). Facebook (FB) is a social media website, where consumers may, but do not necessarily, come to buy things. Facebook (FB) is a pure ad revenue play, which has faced data scandal issues, such as the Cambridge Analytica scandal earlier this year. As a result, Facebook (FB) is working on self-regulations and giving users more choice and control over their data. There is a genuine threat that advertisers will be less willing to spend ad dollars on Facebook (FB)’s platform. The company had also lowered its revenue guidance in its Q2 earnings report as a result of these developments earlier this year. Amazon (AMZN) on the other hand is not a pure ad revenue play, but still a genuine threat to Facebook (FB). Amazon (AMZN), as an e-commerce site, is a website where consumers mostly come to buy things. Hence, in view, advertisers will more likely want to spend ad dollars to gain space on Amazon (AMZN), where there is a better chance of consumers adding the items advertised to their carts if they end up liking it. Don’t get me wrong, Facebook (FB) is still a solid company and doing right by their users by focusing on data regulations, but it is not the best time to hold Facebook (FB) when there are other competitors like Amazon (AMZN) that are well-positioned to take away their ad dollars and the genuine possibility of Facebook (FB)’s future revenue streams being compromised by the data scandal and new regulations. I see a real possibility that Amazon (AMZN) will continue to increase its market share in the $88 billion advertising market, making it another growing source of revenue on top of the company’s existing, well-established revenue-generating units. While Amazon (AMZN) clearly holds strong, multiple streams of revenue income, its rich valuation is an aspect that easily puts off many investors. The stock has corrected by around 20% from its all-time high, and following its recent earnings report, the stock is trading at about 86.2x trailing earnings, and 55.2x forward earnings (at time of writing), according to data from Morningstar. While these numbers are admittedly high in comparison the overall market, it is worth noting that it is certainly not unusual for high growth stocks to trade at high earnings multiples. In fact, in 2015 the stock was trading at levels as high as 909.10x earnings. Compared to those levels, paying for the stock at 92x earnings seems more reasonable. Moreover, the Price/Sales (P/S) ratio for the stock presently stands at 3.5. While this is definitely not a low ratio, it is also certainly not an atrocious level to buy the stock at, especially considering that one of its biggest competitors on a global scale, Alibaba (BABA), is trading at a P/S ratio of 8.6. 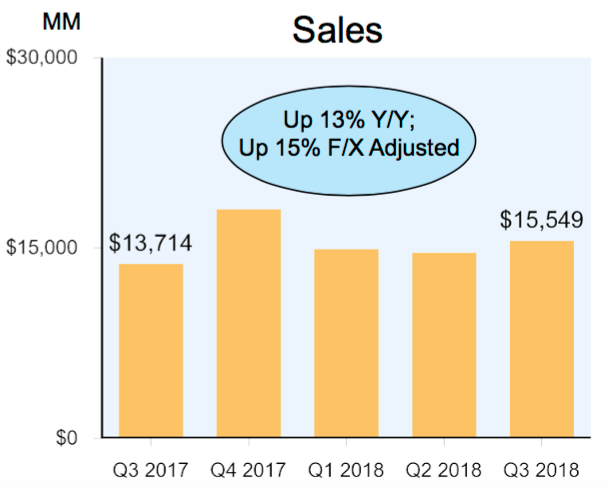 Furthermore, Amazon (AMZN) is currently trading at 28.8x its cash flow, which admittedly is very expensive, especially given that the industry average is only 6.9x. However, one should note that Amazon (AMZN) is also in a stronger position to generate and grow free cash flow compared to the rest of the industry, thanks to the monthly/annual fees it receives from its Prime subscription service. This strength became especially apparent when earlier this year it was able to raise the annual price of its Prime service by $20, and still continue growing its Prime membership subscription base. This additional income will continue to foster its free cash flow going forward, which makes me more willing to pay a higher multiple for its current cash flow, given its incredibly strong future cash flow generating potential. Expecting and/or waiting for Amazon (AMZN) stock to come down to trading at dirt cheap multiples before entering, is not something I would recommend. My personal strategy is, when a correction like this comes along, long-term investors should definitely start taking positions in the stock. What if the stock goes even lower from here? In that case, investors should stay ready to buy more stocks, and gradually build up exposure overtime. How you choose to go about it obviously depends on your personal budget, risk appetite and patience. Amazon (AMZN) stock has come down 25% from its all-time high. This correction comes amid record earnings, but slowing revenues. I believe that over the long-term, the company has multiple, strong sources of revenue to drive future growth. The company is also making strategically wise decisions by raising prices in segments where it holds competitive strength (Prime Subscription Services), and cutting prices in more competitive markets to hold on to its market share (AWS/Cloud). Investors that are looking to get in for the long-term should take advantage of the recent pullback in the price. Disclosure: I am/we are long AMZN.